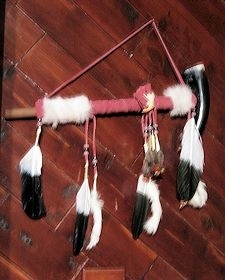 This butter soft, Apache inspired authentic buckskin bag is approximately 4" x 5" and has lots of fringe. Overall length of the bag, including the fringe is about 8 inches. It has a 30" drawstring so there is plenty of room for adjustment for use as a necklace, small purse, or poke bag for your rendezvoux outfit. 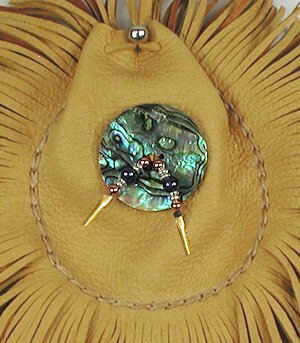 This buckskin medicine bag is decorated with an abalone concho and glass and metal beads. Abalone shell represents solace, greatness of the oceans, a life of beauty, gentleness, caring, comfort, peacefulness, and delight. Abalone shell discs have been traded tribally for centuries, and were symbols of power and protection for ancient travelers. This product was added to our catalog on 09/27/2017.